On the day Adam Lanza aimed his rifle at children in a Connecticut school, Arline and I visited an old friend of hers in a nursing home in Hialeah, a suburb of Miami. Arline was a child when her sister, older by nine years, had a group of friends that included a young man named Manuel and his future wife, Ceci. Arline remembered Ceci as a beautiful and kind young woman who didn’t mind a little kid tagging along. Now Manuel was very ill, and we went to visit him and Ceci. Arline hadn’t seen them in fifty years. When we walked into the small room where Manuel lay, sleeping and unresponsive, Ceci stood to embrace Arline. She cradled Arline’s cheeks in her hands and remarked that Arline looked like a García; Arline’s father and Ceci’s mother were first cousins. Ceci must have been looking for the familiar in a woman she hadn’t seen for so long. Before we left, Ceci told us that she had a gift, and she took a mesh bag from her purse. In it were plastic containers for saving small things – shells, maybe, or earrings — and an index card with a quotation from the Biblical chronicle of Jabez. Ceci, we learned, is Baptist, and as I practiced my Spanish translation skills on the quotation – “Oh, if You will bless me, please enlarge my territory, give me Your hand, and keep me from the terrible things that cause me pain!” – I thought about how important those words must be to her as she watches her husband succumb quickly to Parkinson’s and Alzheimer’s. She was not, she reassured us, a fanatic, and the gift was merely symbolic, but it was the best thing she could give us. It was the best thing. It was best because it was meaningful to her, and she didn’t need to qualify her religious beliefs, although I appreciated that she didn’t want us to think she was proselytizing. In these times of increasingly diverse religious and nonreligious views, it can be awkward to communicate across the differences. A number of recent events, as public as Newtown, as private as the death of a young colleague, have reminded me of the ways people with different beliefs respond to crisis and loss. Samuel G. Freedman, writing in The New York Times, asked why the nonreligious were seemingly absent after the Newtown shootings. The president spoke at an interfaith service, and the families held religious funerals. Where was the humanist community? But I think this is the wrong question. It presupposes a distinct “religious community” and a distinct “humanist” one. It assumes a chasm between so-called believers and nonbelievers. The truth is that the same people filing into those religious buildings were also most likely partaking in other kinds of rituals elsewhere, like paging through photo albums and playing videos of the deceased. Those wooden angels on a hill near Newtown aren’t part of traditional religion; they are folk religion. And all of us, all the time, are engaging in folk religion, even if we don’t call it that. 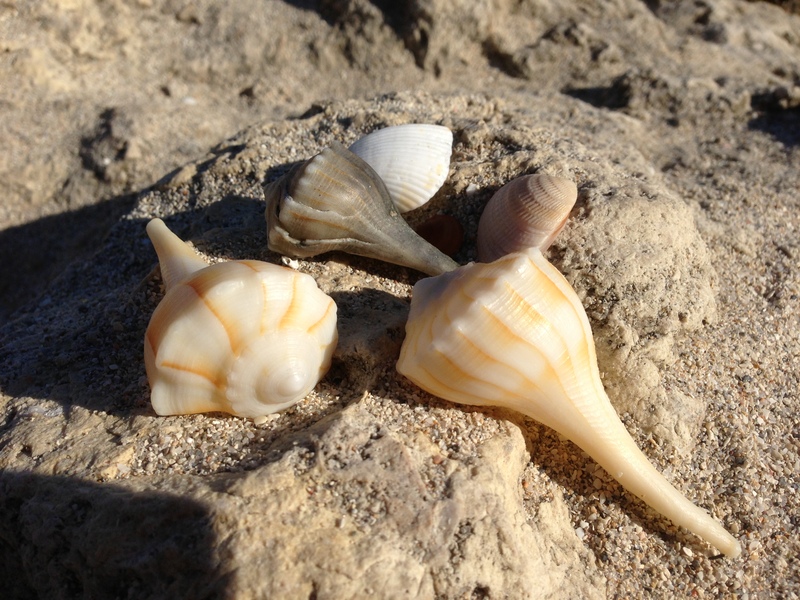 On the beach in Florida, Arline and I gathered a few shells, and they sit now in a small dish on our dining room table, reminding us of the deep meditation that is sea and sand. The purported divisions between believers and nonbelievers belie the fact that all of us are constantly engaged in expressions of meaning-making, and these expressions converge and diverge in unexpected ways. Ceci gave us Tupperware and an index card with a prayer, and we took it in the spirit offered, buoyed by her cheerful optimism despite her husband’s condition. We hope she felt comforted by what we could give her: conversation and time to sit for awhile. We messy humans will continue to make our disorganized expressions of community and connection, sometimes within traditional paths and sometimes without. We will do it through prayers; we will do it with hillsides of wooden angels. We will do it in the shiny-floored rooms of Hialeah nursing homes, where hands touch across fifty years of absence and we recognize our common ancestry in each other’s cheekbones. This entry was posted in Uncategorized and tagged death and dying, faith/belief. Bookmark the permalink. I cried. Your writing speaks truth. Thank you, Chlovena. It’s been years since I saw you. Hope you are well. Beautiful, Allison. “All of us are constantly engaged in expressions of meaning-making:” yes.